Decal graphic kit manufactured by AMR Racing Graphics. AMR Racing continues to set the standard for after-market graphics in the off-road vehicle industry! 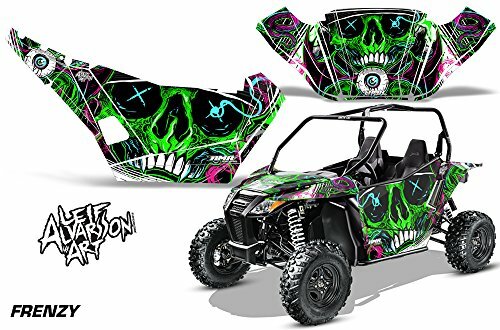 They carry a complete line of graphic kits for MX bikes, quads, side by sides, sport bikes, snowmobiles, jet skis, golf carts & shifter karts. AMR's line continues to expand. With AMR Racing graphics you WILL stand out from the rest!! All graphics are digitally printed with UV resistant inks that are guaranteed to not fade for up to 5 years. These are not your low-quality, 3 color silk-screened graphics. The patented digital technology produces extremely vivid and detailed images with up to 16.5 million colors. Image quality and detail is second to none!---Easy to apply, AMR's kits are made from highly durable, ultra pliable, wreck-proof vinyl. Once the graphic is applied with AMR's triple-layer, aggressive 3M brand adhesive, they will not come off and will hold up to even the most unforgiving conditions. AMR uses the thickest layer of scratch-proof crystal clear vinyl over-laminate for an armor like layer of protection. All kits are custom printed to order and may take 7 business days to produce. Graphics Only - Plastics & Vehicle not included. AMR Racing Graphis uses the thickest layer of crystal clear over laminate for a polished, armor like layer of protection. Instructions come with the kit for an easy installation process. Made and assembled in the USA with all materials from USA. Disclaimer: Graphics will not cover all plastic surfaces. Use of graphics is to visually enhance the look of your vehicle. Not intended to cover or hide entirely the color of your original plastics. If you have any questions about this product by AMR Racing, contact us by completing and submitting the form below. If you are looking for a specif part number, please include it with your message.